Police have arrested a man suspected of ambushing and fatally shooting two police officers in Des Moines. Scott Michael Greene, 46, of Urbandale, Ia., was taken into custody in Dallas County west of Des Moines. Several news outlets have reported that a YouTube video from an account that appeared to belong to Greene showed him arguing with police officers after he claimed that he had been assaulted at an Urbandale High School event last month. 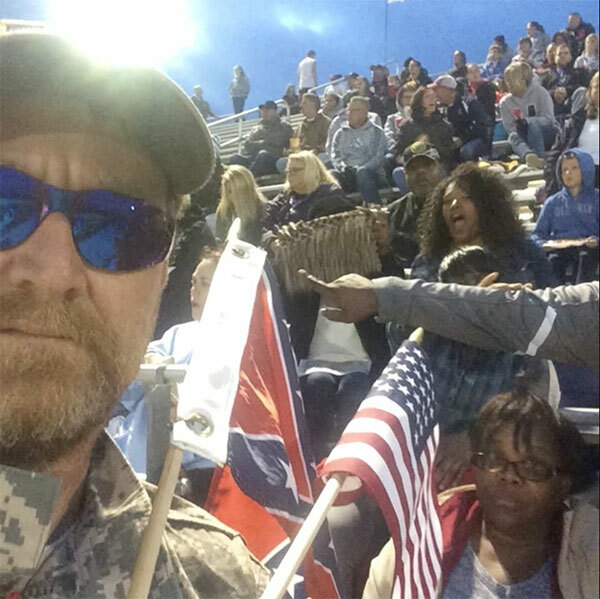 The nature of the confrontation is unclear, but it appears to have originated with complaints about him displaying a Confederate Battle flag at a high school football game. “I will kill you, (expletive) kill you,” Greene said, the Register reported. Public exhibitions of the Confederate flag have ignited widespread fury in the aftermath of a massacre last year at Emanuel African Methodist Episcopal Church in Charleston, S.C., that left nine African-Americans dead. Dylann Roof, 22, who faces the death penalty for the killings, goes to trial on murder and firearm charges next week. The two Des Moines officers were shot dead in two separate ambush-style shootings that took place 20 minutes apart in different locations three miles away from each other. One of the officers was from the Urbandale Police Department and the other from the Des Moines Police Department.